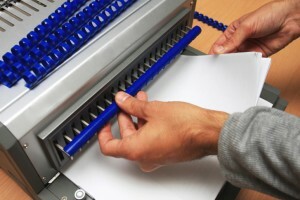 Avoid folding machine jams by making sure you’ve loaded the paper correctly. Folding machines are a great business solution for mass mail-out campaigns. They can get a folding job done in a matter of minutes rather than hours. Still, folding machines require everything to be in just the right position to function smoothly. There are a dozen or so variables that could lead to a paper jam. Here are a few ways you can diagnose your folding machine and prevent paper jams from happening in the future. Paper loaded incorrectly – A beginner’s mistake, even just one sheet loaded wrong can create problems for a few thousand other sheets. Operators should always take extra care when loading bindery equipment. Improper setup – Sometimes it’s easy to overlook small setup details like moving the side lay. Rechecking your setup tasks is a good place to start when you have a jam in your folding machine. Wrongly positioned feeder – If a paper guide is improperly positioned it could bend a corner as the paper follows the feed drum. A guide that is set too tightly may even be denting the paper. Dents, bends or nicks in the edge of the paper due to a feed guide can result in a jam, especially if you’re working with thinner paper. Paper stuck on fold rollers – Paper lodged in the bearings at the edge of fold rollers can cause a jam. If the job isn’t completely dry paper will occasionally stick to the surface of the roller. Dirty and worn fold rollers – Sometimes ink, varnishes, toners and other coatings will deposit onto a fold roller when they haven’t properly dried. Your fold rollers may also start to wear over time which can lead to jamming. If you’re starting to notice problems, consider giving your equipment’s fold rollers a tune up. Static – Static is a frustrating problem for printing equipment because it can appear out of nowhere and can be difficult to manage. At the very least make sure your pressroom is properly acclimated for paper. Damaged fold plate deflector – Paper jams can bend your fold plate deflector which will interfere with paper traffic. If you’ve had a paper jam and problems persist, check your fold plate deflector for dings and bends. Loose screws and bolts – Jam-ups are occasionally the result of loose bolts that have fallen onto a passing sheet or onto the fold plate bottom. This entry was posted on Friday, July 15th, 2016	at 11:07 am	and is filed under Equipment handling	. You can follow any responses to this entry through the RSS 2.0	feed. Both comments and pings are currently closed.